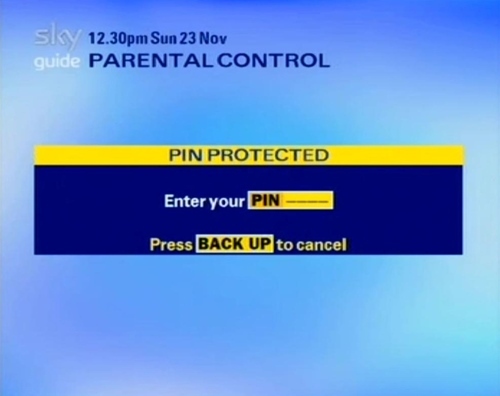 Press Services on your Sky Remote to access many more features, telephone numbers, Parental Control options, System Setup, Favourite Channels and much more. 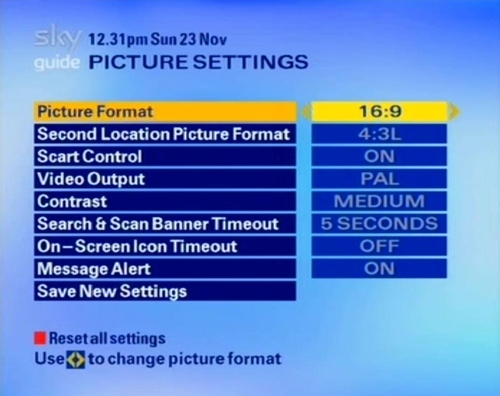 This is the area where you can customise you Sky Digital receiver, picture and sound settings, add and view ‘Other Channels’, those such as other ITV regions not listed on Sky’s Electronic Programme Guide (EPG). It is also through this section where you can access the Installer setup if you should have cause to do so. 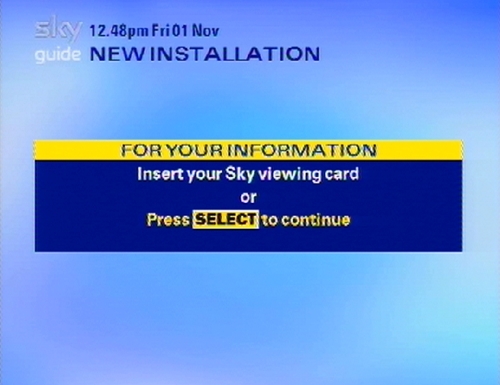 Press 1 to see more information on how to use your Sky receiver. This is just some basic information to get started. The page also contains a contact number for Sky: 08702404040. If your looking for real technical help, calling Sky’s Customer Services is not recommended, their employees have little or no technical knowledge. 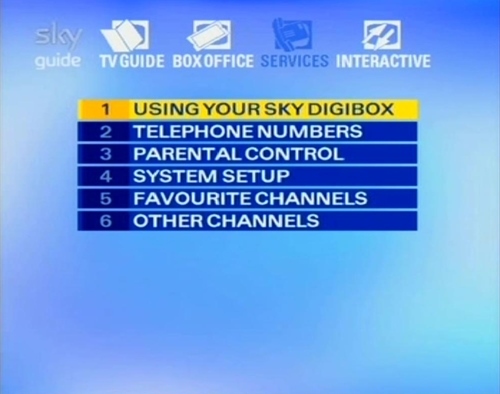 Likewise, your Sky Digibox booklet contains only basic information on using your receiver. Sky receivers are very user-friendly and should present few problems for most users. 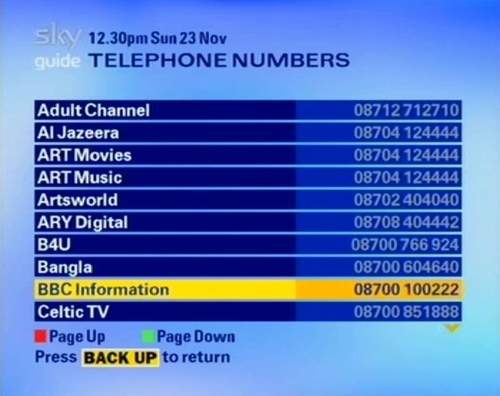 Press 2 for a full list of Sky digital related contact telephone numbers, all the broadcasters on Sky are listed here. Press 3 for Parental Control options, here you can restrict viewing using a number of options, by category, or by price restriction. 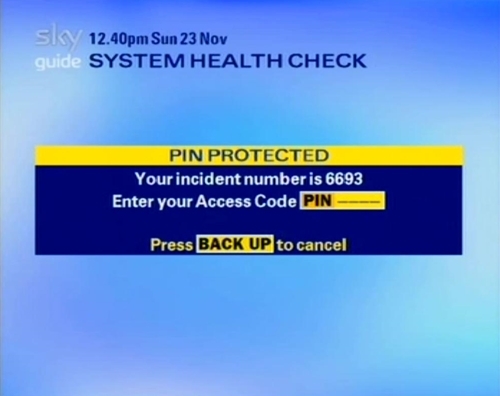 you will be asked to enter a PIN number, this is usually the last 4 digits on your Sky smart card. You can change your PIN number to a new one at any time. If for some reason you can no longer remember your PIN number, contact Sky’s Customer Services on 08702404040, they will be able to help you. Remember to choose a PIN you are unlikely to forget. On-Screen Icon Timeout, this will remove the interactive red button from the screen after 30 seconds. Press the RED button to reset all setting under this section. You may want to check with a broadcaster to see if other languages are available on the Sky platform. By default, the language is set to English. 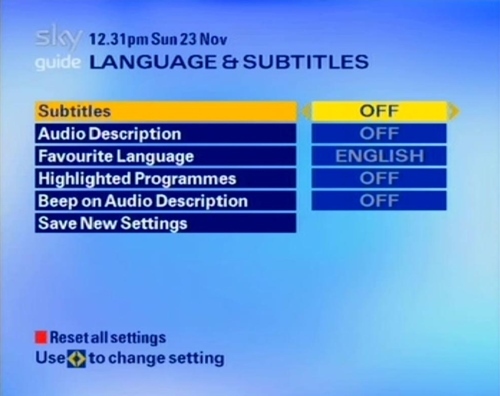 Subtitles and Audio Description can also be activated by pressing the HELP button on your Sky remote. 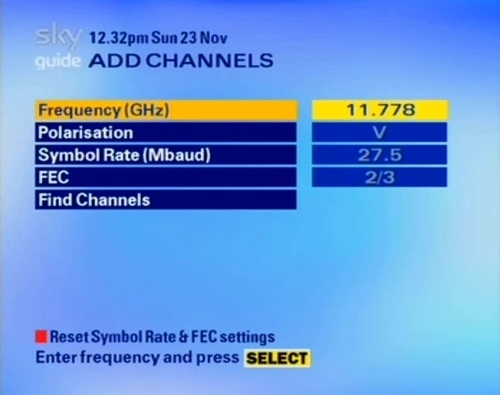 Add TV and Radio channels not listed on Sky’s EPG, like other ITV1 regions, or tests. After typing in the correct frequency, polarisation (Vertical or Horizontal, Symbol Rate (SR) and Forward Error Correction (FEC), press Find Channels. 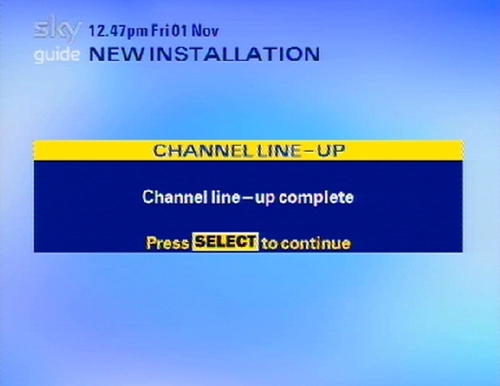 Press the YELLOW key to store and Select when finished storing channels. There is normally no reason to add channels through this option, as almost all, including BBC regions, are listed on Sky’s EPG. To add unlisted channels, highlight the desired channel(s), then press the YELLOW button and a white tick will appear next to the channel. Pressing the YELLOW button once again will remove the tick. 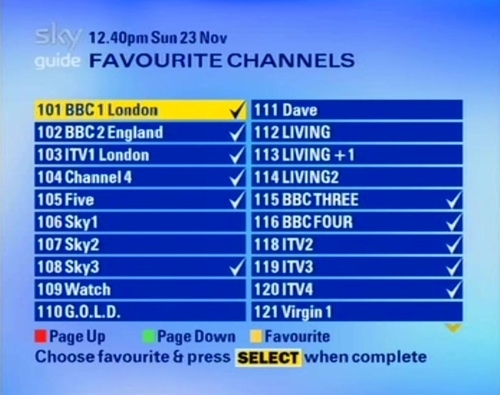 When all the channels you would like to save have a tick next to them, press SELECT. To view these channel, press SERVICES on your remote, choose OTHER CHANNELS, highlight & SELECT. 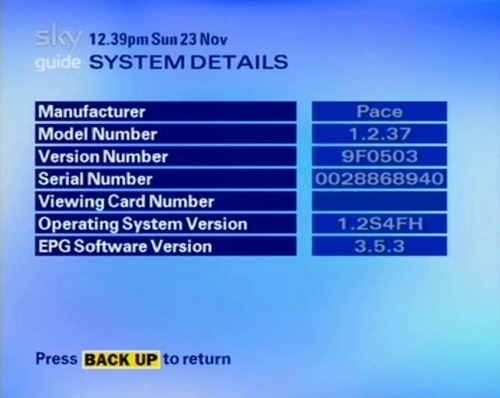 EPG software version. You may need some of the information listed under this menu if you are applying for a new card, or if you have changed receiver. Your viewing card will need to be married to your new box. 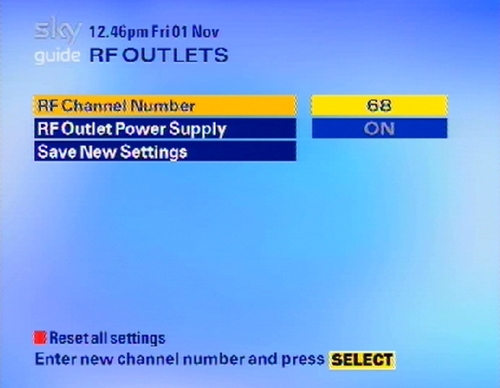 FTV cards work on all Sky receivers. 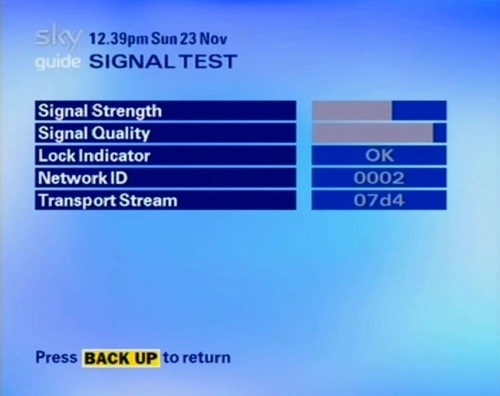 Under signal Test, you can check to see if your receiver is correctly connected to the satellite dish. The screen should show the same information listed on the picture to the left. This is the signal of the ‘Default Transponder’, this is where Sky’s EPG is broadcast, along with the background music. 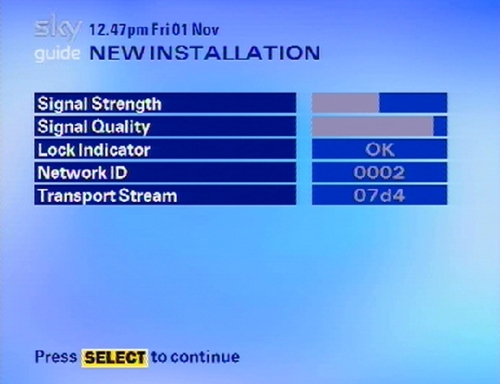 If your receiver is not showing this information, then there is a problem either with your receiver, cable or dish. Check your connections and dish alignment. If your receiver is connected to a U.K. landline you can test the receiver using this option. There are no confirmed reports of this option being used overseas. Remember your Sky subscription is only valid in the U.K., Sky may turn off your viewing card if you are calling from mainland Europe. Use this option at your own risk overseas, or use a UK IP address through a Virtual Private Network (VPN). 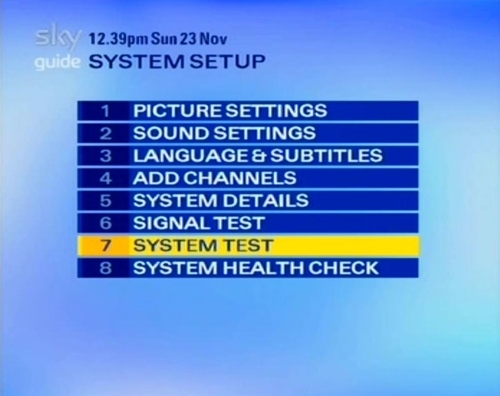 The System Health Check displays a number of diagnostic menus on your digibox. It shows basic information that you could probably get by viewing signal strength/quality readings. System Health Check, shows your STB make, model, LNB, Telephone Line status and allows you to enter individual channel numbers, which it will then scan and display a signal strength reading the code, signal quality reading code and the Transport Stream ID. Press 5 for Favourite Channels, then you can quickly skip to your Favourite channels on the Search and Scan banner using the BLUE button. You can store up to fifty television or radio channels here, by highlighting and marking them as a favourite. Use the RED button for page up, GREEN for page up, YELLOW to store and Select to finish. Press 6 for Other Channels This is where you choose the channels added under Add Channels. 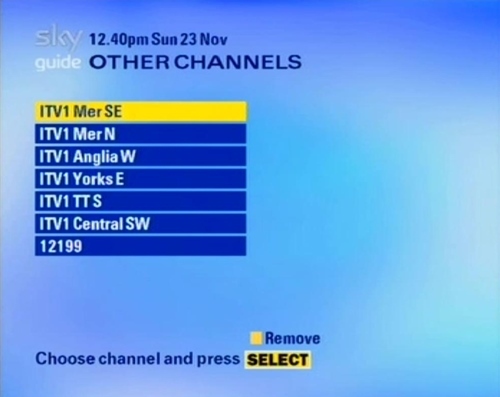 You can store channels not present on Sky’s EPG, like the other ITV regions, or test channels. Just highlight the desired channel (in yellow) and then press Select. There is no reason to add other BBC regions here, as they are all listed on the EPG. Channels viewed through ‘Other Channels’, will only show Now and Next listing. 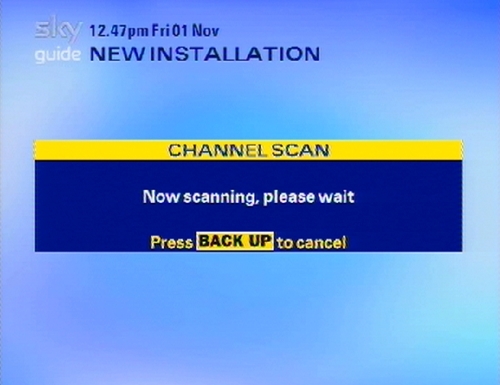 To return to normal EPG viewing, press the SERVICES key, then BACK UP on your remote. Installer Setup is not listed in the System Setup Menu. 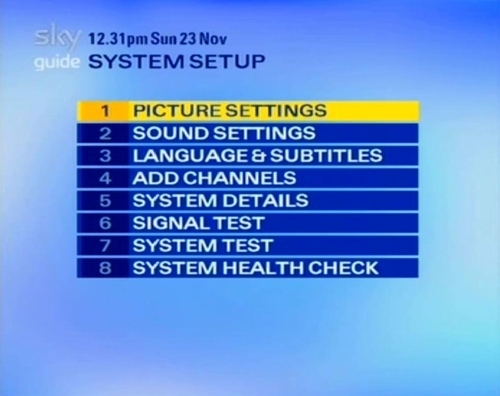 1 Press Services on your Sky remote. 2 Press 4 (System Setup). You should now see the menu shown on the left. Some useful features can be found in Installer setup, to exit press Backup on your Remote. LNB settings can be changed here, low band frequency, high band frequency, LNB power supply, 22 kHz power supply on or off. In most instances, it is not necessary to alter any settings in this menu, this is how it should be set. Default Transponder settings can be changed, though will revert to the original settings once you have left the Installer setup. 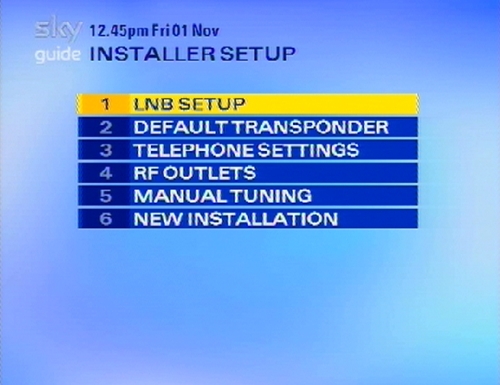 To keep any changes, you will have to unplug your receiver without leaving the Installer setup. Telephone settings, a UK landline is required, this will give you access to the many interactive features available through your Sky receiver, like voting, receiving emails, playing games, paying bills and if you want to use Skybox Office to order PPV films or sporting events. 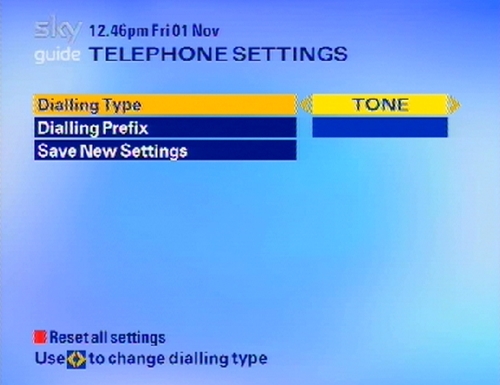 By default, the dialling type is set to tone. RF Outlets, lets you change the channel your receiver uses on your TV if it should clash with another TV channel or Video etc. This is for your coaxial cable connection, viewing through a Scart cable will give a far superior picture both on your TV and when you record programmes on your PVR. 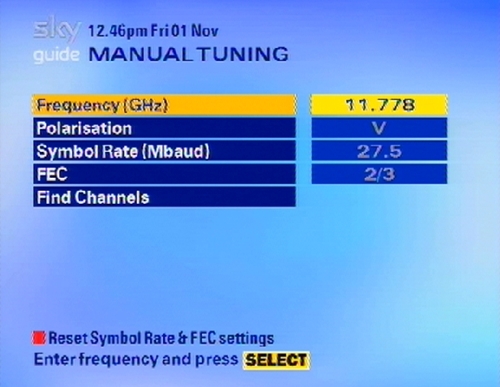 The frequency listed on Manual Tuning is the Default Transponder, this can be changed easily. Once you exit this menu, it will revert once again to the Default Transponder settings. 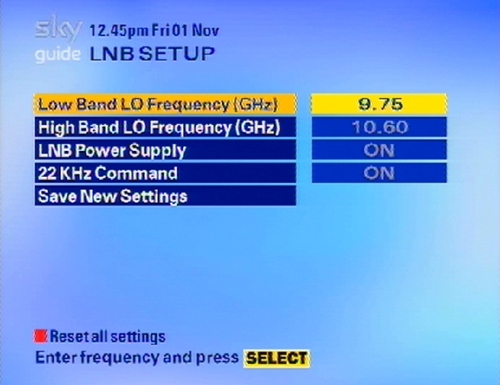 Once “Find Channels” is pressed, a screen will appear showing the transponders signal strength and quality, Lock Indicator, Network ID and transport Stream of the input frequency. Once the search is complete, highlight the desired channel and press the YELLOW key. 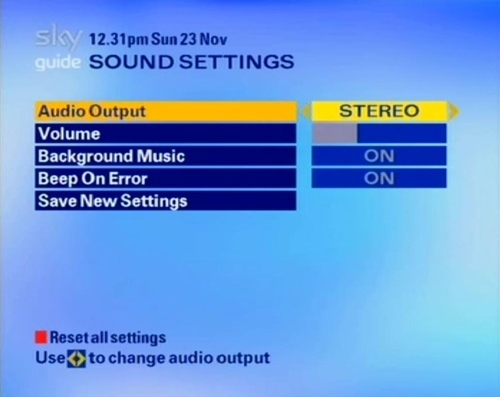 If you wish to reset your receiver to “Factory Setting”, then use this option. Remember that all your favourite channels and those stored under Add Channels will be lost. Your satellite receiver may need its software updated after a reset. In most cases, a reset is not necessary, try unplugging your box and rebooting first.